Property Size 1,502 sq. ft.
Come and relax at this adorable 3 bedroom, 3 Bathroom Condo at High Pointe Resort, a gated community in Seacrest Beach. Overlooking the Community Pool, this Condo is still just steps away from the beach and minutes from Rosemary Beach! Enjoy a cocktail at the resort's beachside bar or take a bike ride to Rosemary Beach! 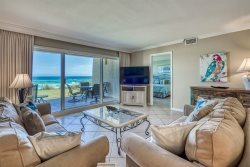 Watch the beautiful 30A sunsets from the condo balcony! The master bedroom has a king bed with private bathroom complete with a huge bathtub and walk-in shower. The first guest bedroom has a king bed and a private bathroom with a shower/tub combo. The other guest bedroom has 2 queen beds and a private bathroom with a shower/tub combo. Call us today to book this lovely condo at High Pointe Resort. Add $160.00 for housekeeping and 11% for tax. There is a $69 damage fee, $30 Booking Fee, and 2.5% fee to process credit card payments. A deposit of 25% of the total holds the unit for you and is applied toward your final payment.